Best Rated Quiet Blenders with Enclosure – This is a roundup of the best rated blenders that have a sound enclosure for quieter blending. No blender by itself is truly quiet, especially when blending ice cubes and frozen fruit. The only way to lower the sound is to have a sound proofing enclosure go over the blender while it is operating. Lower powered blenders, or keeping the speed of blender lower can also reduce sound. 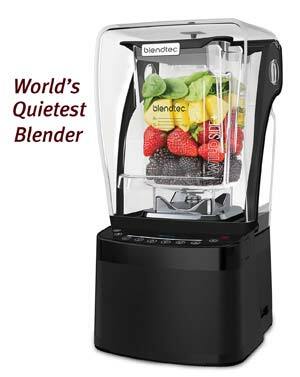 There are not many choices in this sound enclosure blender area, as most are for professional use in smoothie and coffee shops and are the quietest blenders available. Smart-Review limits the selection to only those blenders with the highest consumer reviews. If you want the benefits of higher power blenders without the louder sound, these type of blenders are your ideal choice. Below is a comparison chart of the top rated quiet blenders available, comparing their differences, price, top model features, and consumer reviews. Blender Sound Enclosure = A sound enclosure or cover will reduce the sound of the blender substantially making for some of the quietest blenders on the market. All the blenders on this page have a sound enclosure. A quieter blender will keep you from waking people up in the morning, or disturbing your neighbors if you live in an apartment. Blender Watts = Watts are a measure of energy used, and is a good indication of the power that the blender can produce to crush ice, and make more consistent smoothies. So, higher watts are better. All of the blenders on this page have high watts, and a high HP motor to power through just about any food. Higher power blenders are noisier. Making Smoothies = For smoothies you should get a blender with at least 550-600 watts of power. Without enough power, a blender will struggle to chop up the contents finely enough, and have trouble pulverizing ice. You can also burn out the motor of an under powered blender. These high end blenders under $400 have tremendous power and are the top of the line. High powered blenders are great for green smoothies with spinach or kale.